It’s a bit overdue, but since I’m up late I thought I might as well stay up a little later and get the photos from this Winter’s trip to Tasmania online. The first half of the trip we stayed in Stanley in the far NorthWest of Tasmania (here’s a Google Map of the location). It’s a very cute old Whaling town which is overshadowed by “The Nut” an imposing bit of rock peninsula that is a fun challenge to walk up when the Chair Lift is out of order. We were celebrating Carolyn’s Birthday and Bernadette and Family came up from Launceston to join us and Andrew, Louise and Pauline B flew down too. It was one big group of people! We visited a Tourist Attraction called “Dismal Swamp” which was sort of fun. It’s a large Sink Hole that they have almost managed to make interesting. There was a huge slide you could do down to the bottom of the Sink Hole. It was actually a lot faster and rougher than we expected. It was fun, but I had back pain for days after all the jolts I got going down and Andrew was in pain too. I think they need to iron out a few kinks in the slide. 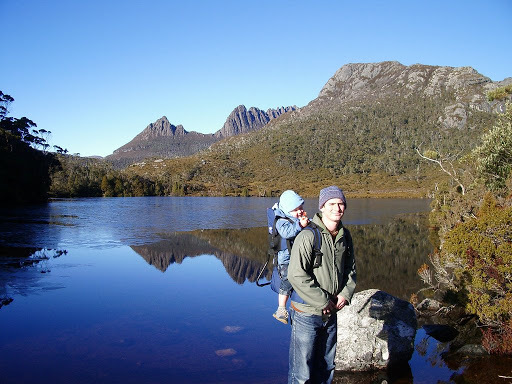 The second half Jannene, Rory and I spent in Cradle Mountain National Park. An absolutely stunning place. Here’s a Google Aerial Map to give you a picture of the isolation. We stayed in the Waldheim Huts within the Park and had cheeky Possums, Pademelons, Wallabies and Wombats walking all over the place (Check out the Video of the Wombats if you haven’t already). Rory on a Swing and off it.